Budding musicians from South Ayrshire schools came together to perform at a sell-out concert last month. 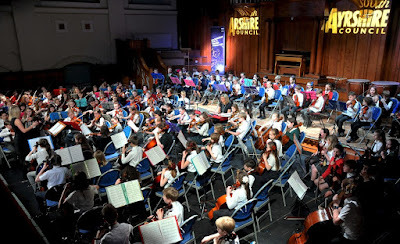 The South Ayrshire Schools Orchestra Concert takes place every year and gives talented youngsters the chance to play in front of a capacity audience at Ayr Town Hall. Around 250 young musicians amazed the crowd with their talents as they played everything from feature film music to other classical favourites. The South Ayrshire Schools Strings Orchestra was first on stage; they played a rendition of The Final Countdown which was a hit for Europe back in 1986. The orchestra which features 120 musicians (P4 – P7) from primary schools across South Ayrshire then followed this up with the impressive New World Symphony by Dvorak. The next performance was from the South Ayrshire Schools Symphony Orchestra which is made up of 80 pupils (S1 – S6) from a number of our secondary schools. Conducted by Elaine Rietveld, the orchestra played the enchanting Baby Elephant Walk and then delighted the audience with some Star Wars favourites. Last to perform was the South Ayrshire Chamber Orchestra which features some of our best young musicians. They did not disappoint as they played the superb Mendelssohn’s Concert Overture ‘Hebrides’ also known as Fingal's Cave. Soloists Matthew Terras (S6 – Prestwick Academy) and Sean Morrison (S6 – Queen Margaret Academy) then enthralled the audience with the Concerto for violin and cello in A minor by Brahms. They played faultlessly and it’s no surprise that Sean has been selected to lead the West of Scotland Schools Orchestra later this year. The Chamber Orchestra’s performance was rounded off with a foot tapping tune from Tchaikovsky and the enthusiastic audience clapped along as the gifted musicians played their hearts out. There was a surprise for three of the performers on the night. Naomi Priestnall P7 from Glenburn Primary), Mitchell Lamont S5 from Belmont Academy and Sean Morrison from Queen Margaret Academy, received a special tutors’ award in recognition of their commitment and dedication to their respective orchestras. The evening was a great success with all the proceeds just over £370 going to the Ayrshire Hospice. Douglas Hutchison, Director of Educational Services at South AAyrshire Council said: “I know the young people taking part had been practising for many weeks and this certainly paid off as their performances were first class.